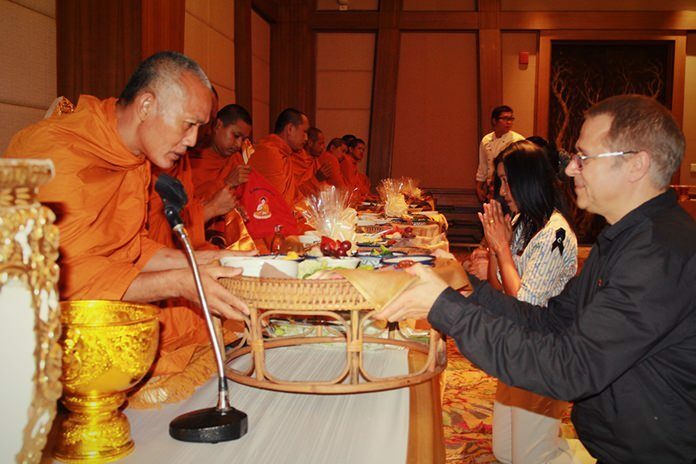 Andre Brulhart (right), general manager of Centara Grand Mirage Beach Resort Pattaya led management and staff on the occasion of the hotel’s seventh anniversary in paying respects to the Royal Garuda, the four-faced Brahma image and the spirit house. Food offerings were presented to nine monks during this traditional ceremony. Centara Grand Mirage Beach Resort, Pattaya.